1. Seen with a horse and their families, the blacksmiths Townsend and Wheeler are outside their home, Cromwell House in Cheapside. The door to the right of the bay window has since been removed and the wall filled in. 2. 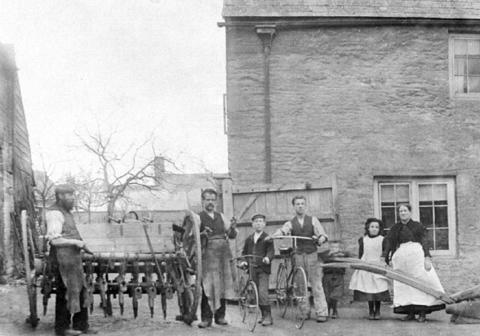 The blacksmith Mr Cripps at Cromwell House with his family worked the forge between 1888 and 1908. A blacksmith worked with metal and at the time this picture was taken most of his work would have been with farm machinery. There is a seed drill in the picture on the left and the handles of a plough can be seen on the right.